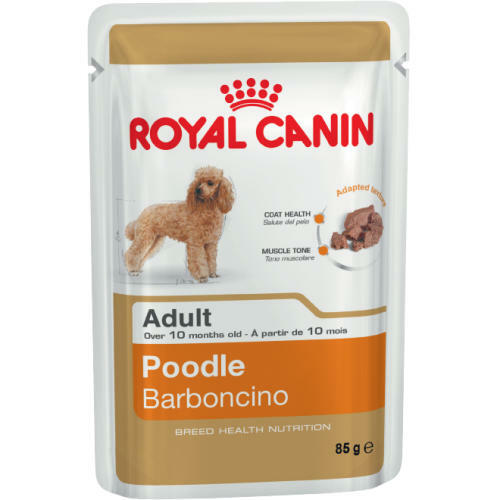 Royal Canin Poodle pouches are a tantalising wet food, specially formulated to help nourish and condition your poodle's wooly coat from the inside out. A unique recipe created just with Poodles in mind, this wet food contains ingredients to help maintain excellent muscle tone, and is specially designed to appeal to your pooch, making sure they eat every last bite! Ingredients: meat and animal derivatives, fish and fish derivatives, derivatives of vegetable origin, cereals, minerals, oils and fats, various sugars. Nutritional Additives (per kg): Vitamin D3: 115 IU, E1 (Iron): 29 mg, E2 (Iodine): 0.19 mg, E4 (Copper): 1.5 mg, E5 (Manganese): 9 mg, E6 (Zinc): 90 mg.
Analytical Constituents: Protein: 9% - Fat content: 5.8% - Crude ash: 1.8% - Crude fibres: 1.1% - Moisture: 78.5%. Nutritional Analysis: Arachidonic acid (%) 0.04, Ash (%) 1.8, Biotin (mg/kg) 0.1, Calcium (%) 0.27, Fibre (%) 1.1, Dietary fibre (%) 1.5, DL-methionine (%) 0.2, EPA/DHA (%) 0.12, Fat (%) 5.8, L-carnitine (mg/kg) 24.0, Linoleic acid (%) 0.97, Lutein (mg/kg) 1.2, Metabolisable energy (calculated according to NRC85) (kcal/kg) 941.0, [metabolisable_energy_calculated_according_to_NRC_2006] (kcal/kg) 963.0, Metabolisable energy (measured) (kcal/kg) 1039.0, Methionine Cystine (%) 0.3, Moisture (%) 78.5, Nitrogen-free extract (NFE) (%) 3.8, Omega 3 (%) 0.23, Omega 6 (%) 1.1, Phosphorus (%) 0.27, Protein (%) 9.0, Starch (%) 3.4, Taurine (mg/kg) 1180.0, Vitamin A (UI/kg) 35000.0, Vitamin C (mg/kg) 85.0, Vitamin E (mg/kg) 118.0.